Using technology that predates electricity, I create beautiful objects to keep you warm today. Handspun Yarn - I'm proud to offer a range of unique handspun, dyed and carded art yarns. I specialize in bulky and a little wild; these are the kinds of yarns you definitely won't find at the Big Box stores. Statement Neckpieces - Using a variety of vintage and handmade materials, I fabricate beautiful and unique necklaces in wool, copper, brass, silk and more. Accessories- Rich, drapey, colorful cowls and warm and textural hand knit winter hats. 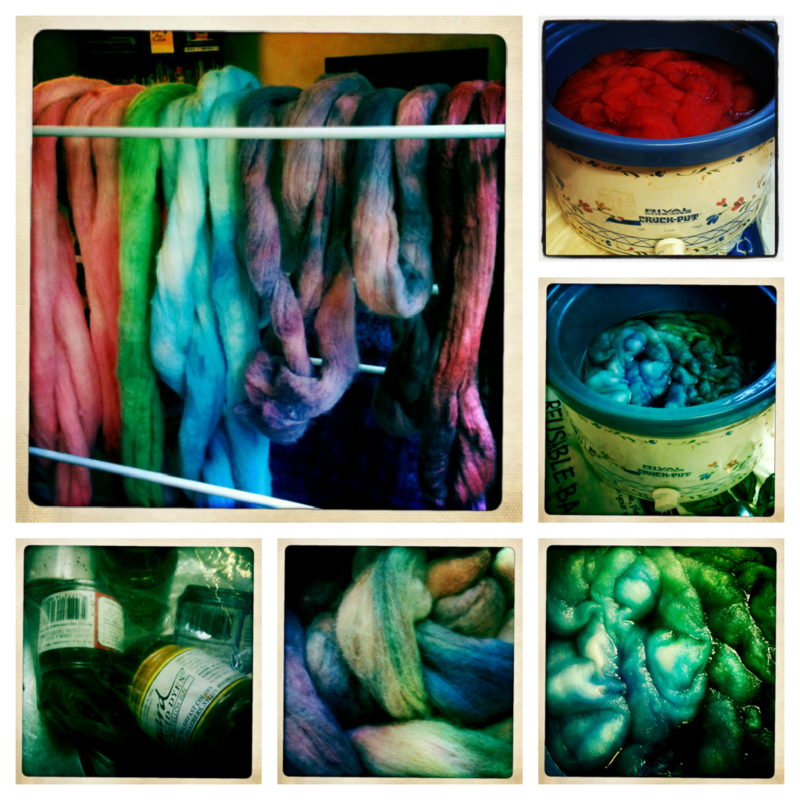 I use a mix of my own handspun and recycled, re-dyed natural fibers. My name is Stephanie Leiderman, and I am a fiber and metal artist working in Portland, Oregon. Material, process and tradition are key to my work. Imagine owning a scarf, hat or piece of jewelry that is entirely handmade, using natural materials from local farms. I buy raw fleece from small-scale producers in Oregon and the Pacific Northwest, and transform it using long established processes. I wash, card, dye and spin wool and other fibers, resulting in products that are completely unreproducible and one-of-a-kind. For more information on the techniques and materials I use, please check out my blog. I first learned to spin on a drop spindle while doing a Work Study at the John C. Campbell Folk School. I asked a very nice lady who was teaching a workshop about the craft, and she got me started in an evening. I've been addicted to all things wooly ever since. Thank you, nice Folk School Lady-I wish I remembered your name! I also have AAS in metals and jewelry. I love to hammer on metal, to shape and form it, and of course, to play with fire! I am always trying to get as close to the source, materials-wise, as I possibly can! I start with raw metal, and with wool directly off the (local) sheep. Otherwise, I seek out unique upcycled materials, working with scraps of fabric and leather, found objects of all kinds, and vintage trims and ribbons.